This was a perfect choice for a trip to the Great Wall. Martin, our driver, picked us up at out hutong hotel and expertly negotiated heavy traffic to get us to the wall where he had VIP privileges, meaning he could park in the closest parking lot. Martin purchased our tickets, explained the gondola and toboggan options for getting up and down and walked us to the gondola entrance. 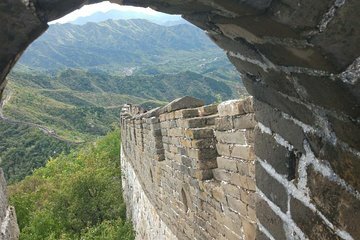 We were able to explore the wall on our own time and meet up with Martin at a convenient location. This was a perfect custom option that allowed us to leave for the Wall at a time that was convenient to us. We were well taken care of by Martin. Marvin Xu was a magnificent host on the day of our trip. He was perfectly punctual and even got us to the airport after we finished the Great Wall early! He looked after getting our tickets at the entrance, showed us exactly where to go, gave recommended routes and we even got a free t-shirt and complimentary water. All in all, a perfect experience.